AUD 8,384 Excl. Duties / Taxes. This Heart diamond is 1.87 carat in weight, and comes with Very Good polish and Very Good symmetry, as verified from an independent gemological laboratory. The diamond is graded O in colour, and has a clarity grade of IF. The diamond's GIA grading report number is 6203012383, which will detail further its specifications and measurements, and will also come with the purchase of the stone. AUD 3,328 Excl. Duties / Taxes. This Heart diamond is 0.85 carat in weight, and comes with Excellent polish and Excellent symmetry, as verified from an independent gemological laboratory. The diamond is graded I in colour, and has a clarity grade of VS1. The diamond's GIA grading report number is 5192560173, which will detail further its specifications and measurements, and will also come with the purchase of the stone. AUD 4,812 Excl. Duties / Taxes. This Heart diamond is 1.01 carat in weight, and comes with Excellent polish and Very Good symmetry, as verified from an independent gemological laboratory. The diamond is graded I in colour, and has a clarity grade of VS1. The diamond's HRD grading report number is 190000035007, which will detail further its specifications and measurements, and will also come with the purchase of the stone. AUD 4,378 Excl. Duties / Taxes. 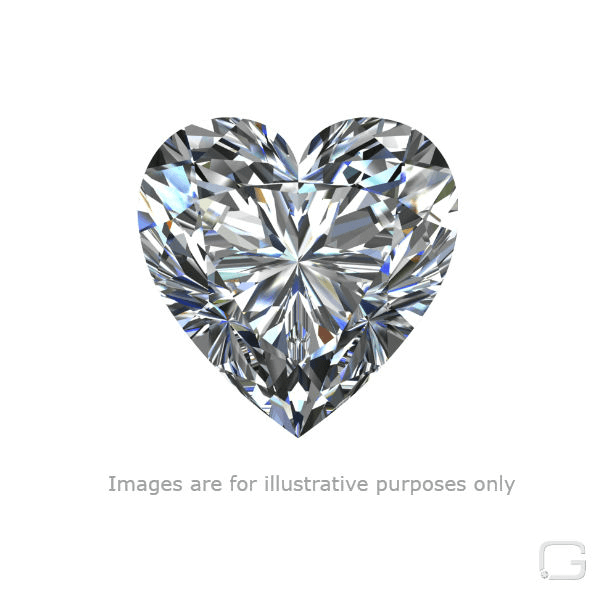 This Heart diamond is 1.06 carat in weight, and comes with Excellent polish and Excellent symmetry, as verified from an independent gemological laboratory. The diamond is graded H in colour, and has a clarity grade of SI2. The diamond's GIA grading report number is 118290708, which will detail further its specifications and measurements, and will also come with the purchase of the stone. AUD 4,035 Excl. Duties / Taxes. This Heart diamond is 0.79 carat in weight, and comes with Very Good polish and Good symmetry, as verified from an independent gemological laboratory. The diamond is graded E in colour, and has a clarity grade of VS2. The diamond's GIA grading report number is 1156030400, which will detail further its specifications and measurements, and will also come with the purchase of the stone. This Heart diamond is 1 carat in weight, and comes with Excellent polish and Very Good symmetry, as verified from an independent gemological laboratory. The diamond is graded G in colour, and has a clarity grade of SI2. The diamond's GIA grading report number is 7312448564, which will detail further its specifications and measurements, and will also come with the purchase of the stone. AUD 35,940 Excl. Duties / Taxes. This Heart diamond is 2.51 carat in weight, and comes with Excellent polish and Very Good symmetry, as verified from an independent gemological laboratory. The diamond is graded F in colour, and has a clarity grade of VS2. The diamond's GIA grading report number is 5316909186, which will detail further its specifications and measurements, and will also come with the purchase of the stone. AUD 3,404 Excl. Duties / Taxes. This Heart diamond is 0.75 carat in weight, and comes with Excellent polish and Good symmetry, as verified from an independent gemological laboratory. The diamond is graded E in colour, and has a clarity grade of VS2. The diamond's GIA grading report number is 2316154080, which will detail further its specifications and measurements, and will also come with the purchase of the stone.